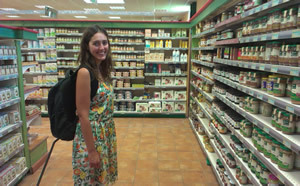 Satoriz is a famous brand of Bio shops in France. Offering huge variety of healthy food, fruits, vegetables, cosmetic and many other products in bio quality. As it is located in France, prices in Satoriz are fairy good when comparing with prices in bio shops or any supermarkets in Geneva. You can find here almost any product of healthy, bio, organic and alternative living such as: dry fruits, nuts, seeds, dairy products, fresh organic fruits and vegetables, 100 % juices made not from concentrate, Bio French vines, grains, lactose free or wheat free (gluten free) products such as pasta, bread or cookies, many vegetarian and vegan products which are not easy to find in other shops such as rice / almond / coconut milk, tofu, tempeh, vegan soya sausages / hamburgers / yogurts, dietary supplements, bio clothes, books related to food and healthy lifestyle and many other kinds of healthy food. The choice of products is really huge and the environment with a service is very pleasant there. Upon asking You can get fresh milk and fresh bread. In Satoriz Val Thoiry is also a restaurant - bistro, where You can have a healthy delicious lunch or dinner.